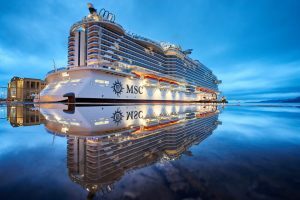 MSC Cruises will bring beloved football legends, the Miami Dolphins alumni, to the sea on a Dolphins Fan Cruise on March 17, 2018, aboard the brand-new MSC Seaside. The Miami Dolphins Fan Cruise is the result of a three-year partnership between MSC Cruises and the NFL team, and it will be hosted annually over the next three years. Cheer with Miami Dolphins cheerleaders and hype up the crowd with team mascot, T.D. Enjoy special performances by the cheer squad and T.D. Beyond the March 17 fan cruise, MSC Seaside also will host the Miami Dolphins Cheerleaders for their annual calendar shoot on April 28, 2018, when cruise guests can catch a behind-the-scenes look at the cheerleaders as they don swimsuit and lifestyle attire aboard the ship and in the Caribbean ports. The cheerleaders also will host special programming on board for participating guests.